New products kick-start growth, but a retailer’s ability to answer questions about those products determines success in supplements. By any account, the supplement market is holding steady, even as it grows a bit slower than it has in previous years. Sales of vitamins, minerals and supplements grew 5.3 percent over the course of 2016, but slowed to 3.8 percent growth in 2017, according to Natural Foods Merchandiser’s annual Market Overview Survey. Still, the market has reached an impressive $15.6 billion in sales, thanks to the fact that 76 percent of U.S. adults now take supplements, up from 64 percent just 10 years ago, says the Council for Responsible Nutrition’s 2017 Consumer Survey on Dietary Supplements. That’s not to say there wasn’t significant or even explosive growth in select categories over the course of 2017, keeping the market in the green. SPINS says that sports nutrition is still immensely popular, with sales growing more than 16 percent over the course of the year. Sales of whey- and casein-based protein supplements grew nearly 60 percent over 2017, and pea protein, specifically, grew 120 percent. This is no surprise, as CRN’s survey revealed that sports nutrition products are taken by about 30 percent of supplement users overall; protein, specifically, is taken by 24 percent of male supplement consumers and 19 percent of supplement users of either gender. Other popular categories on the rise include probiotics, with 16 percent of all supplement consumers purchasing such products. Indeed, survey data from Natural Foods Merchandiser reveals that probiotics are a top growing category for 55 percent of natural retailers. So what’s holding the market back from increased growth, overall? Mintel’s latest “Vitamins, Minerals, & Supplements in the U.S.” report, published September 2017, says slowing growth can be attributed to consumer struggle with two main issues: confusion in the aisle and the price of the products. Mintel’s report found that supplement consumers believe in the health benefits of supplements—with 44 percent of those surveyed saying so—but they still struggle with the cost. Second only to a recommendation from a doctor, a low price tag is a top purchase influencer for consumers, and 27 percent of those surveyed think that supplements are expensive. Values like this, often the calling card of independent natural stores, are resonating with supplement shoppers who, according to CRN’s survey, are more likely than non-users to prioritize such healthy living values as exercising regularly, getting a good night’s sleep, maintaining a healthy weight and trying to eat a balanced diet. As a result, supplements are doing well in the natural channel. 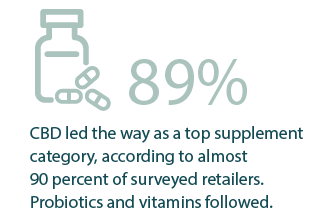 NFM’s surveys show that supplements now make up nearly 30 percent of natural stores’ sales. Small independent stores (smaller than 1,200 square feet) posted an average of 8 percent growth, while larger stores posted 7.2 percent growth. Indeed, a quarter of stores surveyed by NFM reported sales gains of between 5 percent and 10 percent, and an additional 12 percent of survey respondents reported gains greater than 10 percent. Organic supplements are another way independent stores are differentiating themselves. Mintel says that 45 percent of supplement consumers are persuaded by natural and organic claims on pack, and 25 percent of consumers say it’s a top factor influencing their product choices. NFM’s survey confirmed that organic supplements are on the rise among independent stores, with 66 percent of respondents reporting sales growth of any kind, and 9 percent reporting growth over 10 percent. Interest in new supplements like hemp-derived CBD oil is also bringing new and information-hungry shoppers into the supplement aisle, with 89 percent of NFM readers who answered a survey question about supplement standouts saying that it was one of the fastest growing offerings of 2017. SPINS says sales of CBD supplements grew a whopping 302.4 percent over the course of 2017, growing from a roughly $1.9 million industry to a $7.7 million industry just one year later. “While there are repeat customers on CBD, it’s new enough that people are just trying to figure out what dose or carrier they want,” says Evans, which leads to even more questions—questions that independent stores are equipped to answer. Download the full 2018 Market Overview, complete with charts and methodology, below.